good location. nice rooms. There were some comments around smaller lift. there is a larger lift as well. Great location. Extensive and tasty buffet breakfast. Clean room and bath. 1 block to bus. 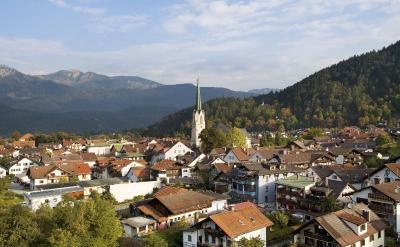 Garmisch is a charming village and well worth visiting. STAFF WAS SUPER HELPFUL! The sauna was amazing and the location was great to get to hiking, tourist attractions and restaurants/entertainment/shopping. A/C was great and a luxury in Europe. Location very nice. breakfast very good. Cleaning excelent. 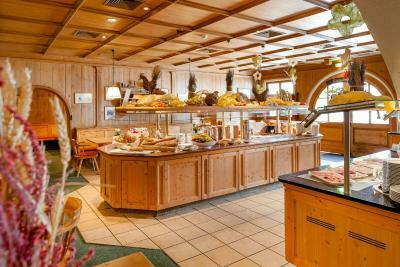 The breakfast buffet was excellent, big selection and staff was friendly. This place was wonderful! The bar was open late (if we wanted a night cap after skiing), employees were very friendly and all spoke English, breakfast was DELISH! Would highly recommend. Garmisch is beautiful and the hotel is nice and alive. The Spa and Sauna were great. The restaurant served wild venison for dinner, and it was delicious. The location is near shopping and entertainment. Everything thing in this hotel is awesome. It is nice and quite. The location is great and the parking lots are good. Just a worn out hotel. Great breakfast but the rest of the staff is not service oriented. 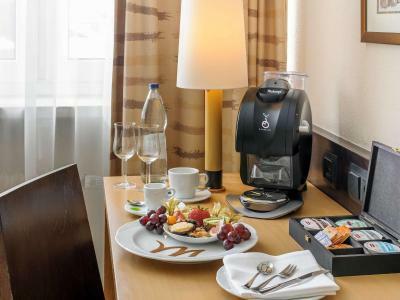 Mercure Hotel Garmisch Partenkirchen This rating is a reflection of how the property compares to the industry standard when it comes to price, facilities and services available. It's based on a self-evaluation by the property. Use this rating to help choose your stay! 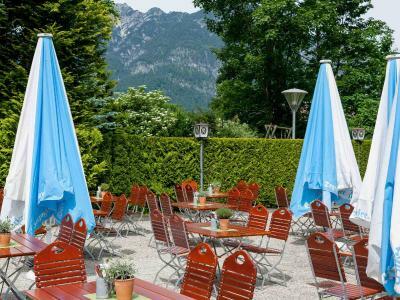 This completely nonsmoking 4-star hotel in Garmisch-Partenkirchen offers modern leisure facilities including an indoor pool and a tennis court, traditional Bavarian rooms, and a country-style restaurant with beer garden. 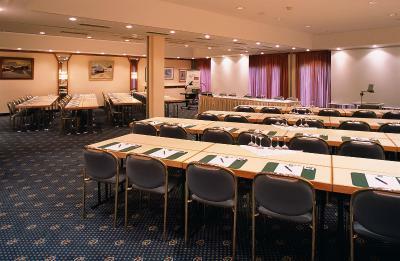 The rooms of the Mercure Hotel Garmisch Partenkirchen feature a brightly furnished seating area and satellite TV. Wi-Fi via hotspot is provided in all areas. 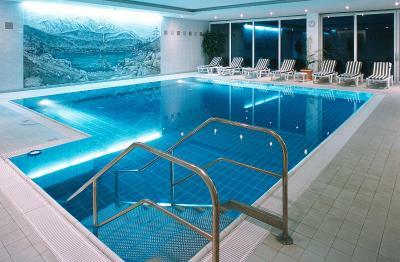 The spa area of the Mercure Garmisch includes a gym, golf practice range, and cosmetic services on request. 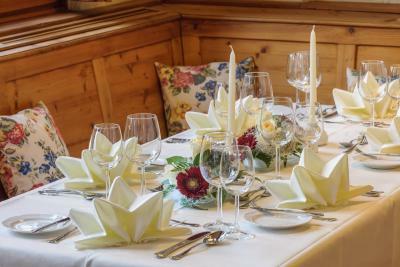 Guests are welcome to relax in the Mercure’s Alt Partenkirchen restaurant. 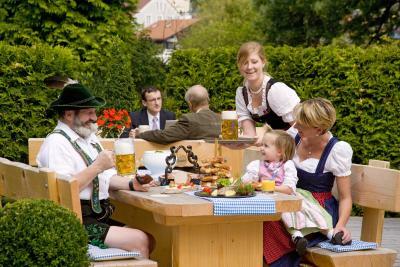 Popular Bavarian food and children’s meals are served here every day. 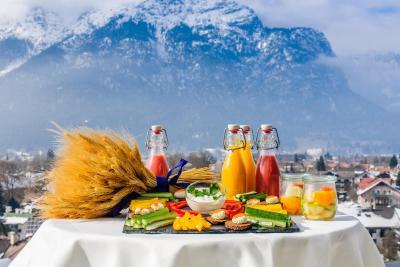 The Mercure Hotel Garmisch is an ideal base for hiking, skiing, and horse riding near the Zugspitze mountain. 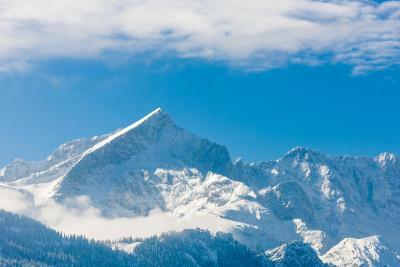 When would you like to stay at Mercure Hotel Garmisch Partenkirchen? 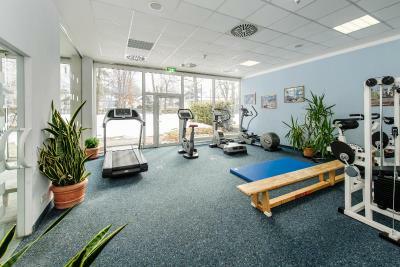 Bavarian-style furnished room with flat-screen satellite TV, a seating area and a mini-bar. Bavarian-style furnished room with flat-screen satellite TV, a seating area and a mini-bar. This room has a double bed that is only accessible from one side. This room features a mini-bar, a seating area and a flat-screen TV. 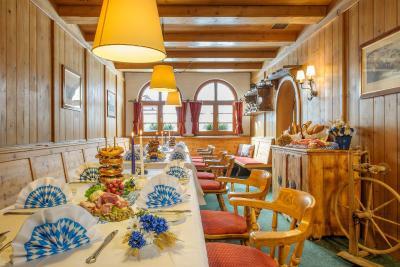 House Rules Mercure Hotel Garmisch Partenkirchen takes special requests – add in the next step! Debit card Mercure Hotel Garmisch Partenkirchen accepts these cards and reserves the right to temporarily hold an amount prior to arrival. Mercure Hotel Garmisch Partenkirchen accepts these cards and reserves the right to temporarily hold an amount prior to arrival. Please note that children can be accommodated in some room categories upon request and need to be confirmed by the property. Please contact the property for further information. Staff was quite rude from front desk to include the restaurant. On a double bed single duvet were given. The bed covers were old and looked like used before ! No house shoes in the bath room - no sauna towel in the room - no safe in the room (I am not used of this at a 4 Star hotel) ! ! ! Location directly at the walking street with good restaurants. Very polite hotel staff ! Beds were too soft and the pillows? They need to have more than one person at Reception especially during busy hours. Friendly reception and staff. Decent building and facilities. Near restaurants and shops. The staff, even I informed the reception that this is my third visit to the hotel looking for a special treat as a regular customer but I did not get what I expected. I asked for additional pillows several times but I didn’t get them till the time of the check-out. However, it seems that this will be my last visit for this hotel due to the badness of the treatment from the staff except the staff of the breakfast were very friendly. I liked the staff and their great cooperation with the guest. The location was good walking distance from the center. Front desk hotel staff not friendly. I am spending money at your business. Act like you care even if you don't. I lived in Germany in the 80's. Staying at this hotel was like stepping back in time, not a good thing. Same carpet and decorations from the 80's. Needs renovations old and worn.